Located on the doorstep of the Rocky Mountains, Buckley Air Force Base is in Aurora, Colorado, a suburb just outside of Denver. There are many retired and military families within the community and Colorado in general. Those relocating here will find a wealth of outdoor activities within easy reach and fabulous sunny days. 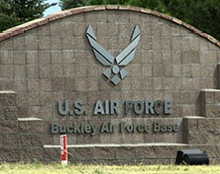 Buckley AFB is home to the 460th Space Wing. Tasked to build the newest base in the Air Force, the 460th Space Wing supports varied space missions and 28 tenant units.